Today's guest comes with a perspective unusual on this blog: Before turning to fiction-writing, he had a career in TV and film. I asked Canadian writer Paul Almond to discuss the differences between these two types of storytelling. Yes indeed, there is quite a difference between writing a screenplay and writing a novel. After some forty years directing and producing television dramas and motion pictures, during which time I wrote quite a few, I realised that since screenplay writing was a very tight little craft, novel writing might well be that also. So when I had open heart surgery in 1990, and could no longer make movies, my wife, Joan, insisted I turn to my first love, writing. So now what? In a screenplay there were so many rules, so many points at which the plot had to turn — as Linda Seager so cleverly outlined in her modest, but essential, book, Making A Good Script Great, I thought that perhaps the same kind of skill might required in writing a novel. So I enrolled for two or three years in the full curriculum of writing programs at UCLA extension. Curiously enough, most of the students (of all ages) seemed to want to write screenplays to submit to the studios. They believed (rightly, I’d say) that studio executives were such idiots, they didn’t know how to read a screenplay. So they wanted to learn novel writing only to submit them to studios for screenplays. and leave it to the art director and set decorator to do their job. You had to write that description and find a way to do it in a few sentences. That was the first big difference. The second big difference was that screenplays are written in the present tense. Most novels are written in the past tense. I found that out when I started to turn one of my screenplays into a novel. My instructors soon showed me how wrong I was. There is, of course, the question of literacy. When George Lucas wrote “Star Wars”, it was apparently horribly illiterate. I had the pleasure of employing several from his British production crew right after it, who told me. It is of course hearsay. For advice on the actual writing, there are as many different “experts” as there are novelists: whether to use adjectives or not, adverbs or not, and other adjuncts to simple good writing. Writing schools with their own rules proliferate, the best being one (I hear) in, of all places, Iowa. But two or three years away to study at a school was not possible, so I did my best with UCLA extensions. And yes, I did learn a great deal. But even so, I still wrote two full-length (unpublished) novels (one did come out in a French translation) before I sat down to The Deserter, the first book of The Alford Saga. It went to practically every agent in Canada and several publishers, to no effect whatsoever. I sat down and wrote the second book, and then the third, and so on. After six or seven years, my wife again took me in hand and said, “Paul, just get them published.” So by that time, I found a couple of publishers. Indeed, the first five books of the Saga are now in print, and my new publisher, Red Deer Press, a subsidiary of Fitzhenry and Whiteside, has happily taken all eight books. The next two, The Gunner (spring 2014), and The Hero (autumn 2014) are coming out next year, and The Inheritor in 2015. The fact that a couple of them have become national bestsellers in Canada just shows what agents know. As you can see, I'm not a big fan of agents. Every publishing contact, I did myself. 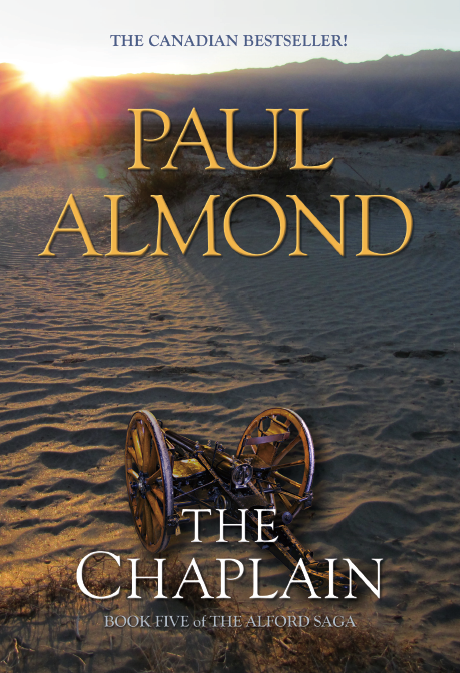 You can learn more about Paul Almond on his website. 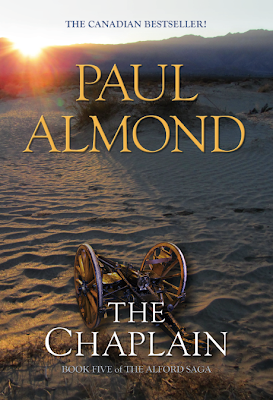 You can buy The Chaplain (The Alford Saga, Volume 5) on Amazon. Today's guest, Anola Pickett, has made an essential discovery: Not only does history not need to be boring to learn, but it can be an absolute joy to teach, especially when presented as fiction for kids. She shares the journey of discovery she undertook to research and write her novel, Whisper Island. No one is more surprised than I am that I now write historical fiction for young readers. When I was in school, I found history and geography classes dry and boring, based on memorization of dates and places. Fortunately, I audited a college course in Elizabethan England because it tied in with my English major. The professor was a witty, engrossing teacher who led her class into the lives of the English during that period. It was fascinating to study history through people rather than the pages of a text. To see them and hear their language brought their story to life for me. I’ve tried to do the same in my historical novels. 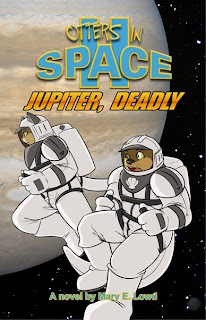 By exploring a piece of American history through the eyes and ears of my characters, I hope I’ve brought a time and place to life for young readers. My research has taken me to Cache Valley in Utah, the Blackfoot reservation in Montana, and the barrier islands of North Carolina. I’ve photographed those places and visited the local museums. I’ve read books, newspaper and diaries to gain a sense of place and culture. Most importantly, I’ve listened to many people happy to share their family and community stories. Each experience has given me a real and specific sense of history. The journey to my new novel, WHISPER ISLAND, began several years ago when I visited the Outer Banks and heard a park ranger speak about notable shipwreck rescues along the North Carolina coast. The details of a 1913 story caught my fancy. The captain’s wife was the first to be conveyed off the ship. All the way to shore, she wailed about the loss of her clothes and finery, completely overlooking the fact that men were risking their lives to save hers. The captain was the last off the ship, and he carried his St. Bernard in his arms. He later gave the dog to the surfmen who rescued his crew and family. I let that little story noodle about in my imagination while I tried to build a plot around it. A girl character named Primmy stepped into my imagination one day, and I decided to make her the main character. But one character and an interesting historical fact do not make a novel. I needed more. Another trip or two to the Outer Banks, especially to the Chicamacomico Life-Saving Historic Site, led me to the important, but mostly forgotten, work of the U.S. Life-Saving Service. A group of courageous, determined men, they went to the aid of ships that wrecked on the shoals off their coast. They went out no matter the weather or time of day. Theirs was truly a 24/7 job. Language is an important window into a time and place. While researching life on the Outer Banks in the early 1900’s, I came across a book titled Hoi Tide, which explored island language. Some words intrigued me, so I used them to introduce my chapters. If you read the book, you’ll learn the meaning of meehonkey and mommucked, for example. Now I had more information about a group of brave men. I knew more about island language. But I still had no real plot, so I continued to dig into the USLSSS history. When I learned that females weren’t allowed to serve as Life-Savers, I’d found a problem for Primmy to solve. She’s only twelve, but Primmy’s spunky and determined to prove her mettle. 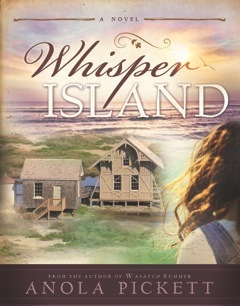 Read WHISPER ISLAND to find out if she succeeds! Learn more about Anola Pickett on her website. Purchase Whisper Island on Amazon, Barnes & Noble, and elsewhere. We have an especially interesting and practical topic today from author Sandra Saidak, who writes novels inspired by prehistory and folklore. Her latest work is The Seal Queen, and she shares some insight into how its cover came to fruition. Of course I knew that artists did things a certain way—notably their way. After all, I’m an artist myself, in that I’m a writer. As far as I’m concerned, writers, painters, musicians, costumers, jewelry makers, and several groups I’m probably leaving out (sorry folks) are artists. And there are certain stereotypes associated with all of us: we’re flaky; we create when the spirit moves us, not because someone tells us to; deadlines are more targets to aim for; we’re passionate about what we do, or we don’t bother to do it. I’ve been a writer since I could hold a pencil and make letters. But my first novel was published in November, 2011. Since then, I learned a startling fact: I am no longer a single-person business. I need professional help (no, not that kind). With every book, I need editing, marketing advice, computer help, and the most exciting so far: professional cover art. I was nervous, but still very excited when I approached my first artist. I knew just how it would work: I would describe in words what I could so clearly see in my mind’s eye, and I’d get to watch the process of seeing it come to life in all its glory. Then the plan met reality. I worked with three artists before The Seal Queen was finally graced with the cover you see here. I’m not quite sure what happened to the second artist. I found him through DeviantArt. We exchanged e-mails. I sent descriptions, he sent a price quote. Then nothing. Apparently, somewhere along the line, he had decided we weren’t a good fit after all. That was a new one for me. The next artist was the one who finished the piece on time, and got it to look like what I had envisioned. Fred Capp is an old friend of mine, and I was nervous about working with a friend. What if I didn’t like what he came up with? What if he flaked out like the others? What if the art was great, but he couldn’t meet the deadline? What if we ran into artistic differences? What if he couldn’t draw a seal! I discovered I was scaring myself. And some of those things did become issues, but I’m happy to say we worked them out. And we’re still friends. Out of all this, I’ve come to understand certain differences between the people who write the books, and the people who create the cover art. Mainly, that an author will usually work on one project at a time. An artist will likely be juggling many projects at once. And every client is concerned about the art being perfect for his/her work; that this book will be released on time. The artist also has the difficult balancing act of getting the author’s vision to appear on a piece of paper (or computer screen). Easy if you’re a mind reader. Not so easy if all you have to work with are words. So a toast to all the artists out there, in all the different media. As everyone who’s done any of it before knows: it’s not as easy as it looks. You can learn more about Sandra Saidak on her website. 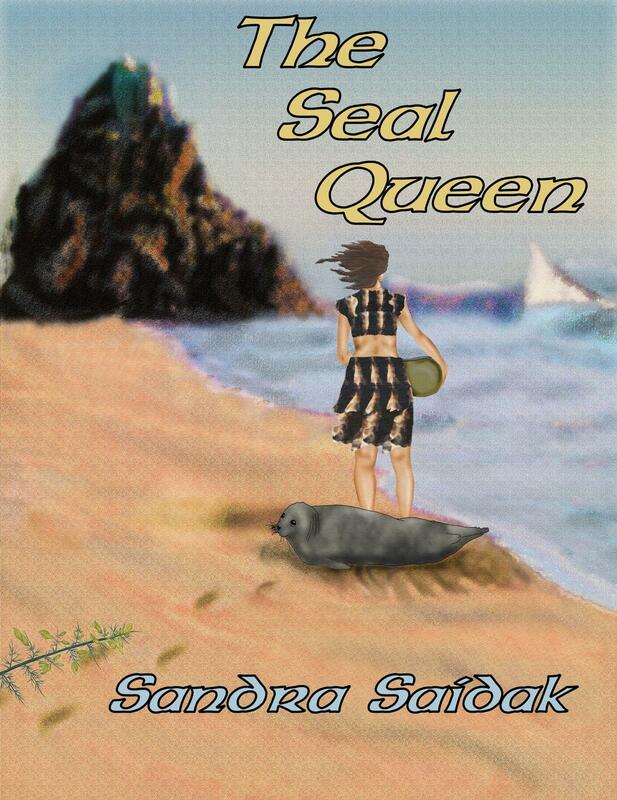 You can purchase The Seal Queen on Amazon.